The Portuguese love their food. Travel around Portugal and you'll even find proud gastronomy between two slices of bread. 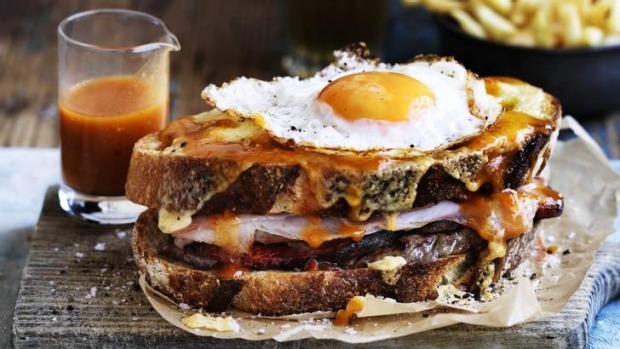 The Francesinha (meaning ''Little Frenchie'' in Portuguese) is Portugal's decadent answer to the croque-madame. It's a huge meat-filled monster topped with egg and cheese, smothered in a beer-based sauce, and always served with French fries. 1. For the Francesinha sauce, heat the butter in a medium-sized saucepan over high heat and add the beef trimmings or chicken bones and fry until well browned. Add the carrot, onion and salt and cook, stirring regularly, for five minutes until the vegetables are caramelised and fragrant. Stir through the tomato paste and cook a further minute, then add the bay leaf, port, beer and milk, and bring to a simmer. (If using chilli powder, add it at this stage.) Simmer for 30 minutes, then stir through the cornflour and piri-piri (if using) until the sauce is thickened. The sauce should be the consistency of thin gravy. Strain the sauce to remove any solids, adjust for seasoning and keep hot until ready to serve. 2. For the sandwich, toast the bread and butter it lightly. Fill the sandwich with the smallgoods and cooked meats and top with another slice of bread. Lie the cheese slices over the top slice of bread so they overhang the sides of the sandwich. Grill the sandwich so the melted cheese wraps the bread. 3. To serve, top the sandwich with a fried egg and place it in a deep dish. Pour over the hot Francesinha sauce or serve in a small jug to add as desired, with french fries and a cold beer alongside. Also try: Adam Liaw's Lisbon-style pork bifana.